You may add guests and visitors to your sites. This is for guest members who are not officially registered. We strongly advise against adding students in this way. Please rely on your school’s registration process to add your students to your site. You may also add a fake student account, and then add it in all of your sites so that you can log on and see exactly what your students see. The steps for adding a guest or a fake student to your site are the same. 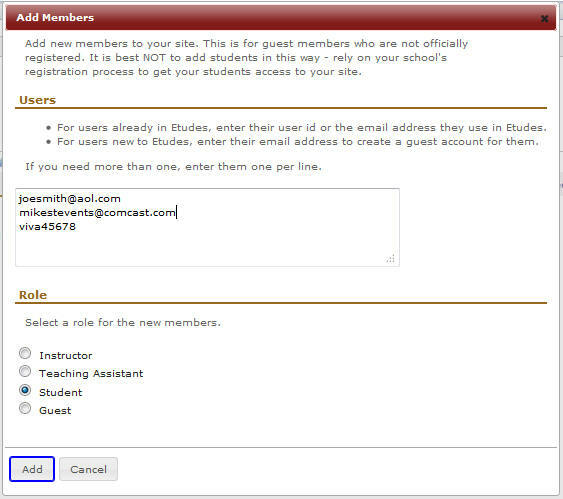 Enter a valid email address of your guest or their userid, if they already have an account in Etudes. If you need to add more than one guest to your site, enter them one per line (see example below). If you are adding a fake student account, enter a different email than what’s in your instructor account. If the email account you added is new in Etudes, the individual will receive a password in their in-box. If the individual was already in the system (guest or official user), she will receive an email that you added her to the site, but she will not be given a new password. She will need to use the userid and password she had.